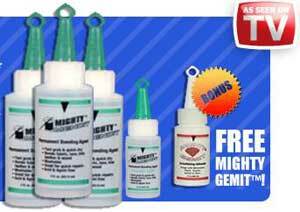 Mighty Mendit is not a glue, but a flexible bonding agent that grabs, adheres and interlocks the fibers of virtually any fabric for a permanent repair. Sewing takes forever, but with Mighty Mendit, you can just apply and gently touch for permanent repair of pillows, comforters, furniture, curtains and more. MightyMendit dries crystal clear and is safe for most fabrics & surfaces. There are hundreds of uses such as mending pillows, comforters and curtains without removing them or making furniture repairs to save money. Mighty Mend It dries crystal clear and is safe for most any fabric. Plus it’s machine washable. Even after 50 washes the bond still stays strong. It’s the fast way to mend, hem, and wear it again! Mighty mendit is one of the best products I have used. I was never good with sewing, and it always seemed like it took months to pick up the sewing needled and get something stitched. I repaired the hemmed of my pants the other day, washed the pants and it worked perfectly.